We’d love your help. Let us know what’s wrong with this preview of Ladies of Gothic Horror by Mitzi Szereto. 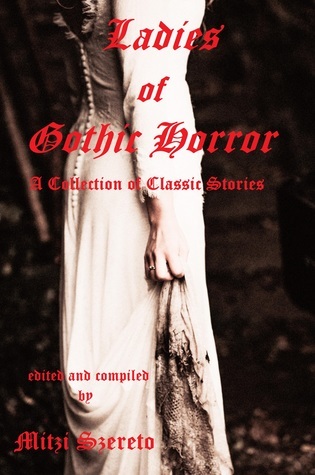 To ask other readers questions about Ladies of Gothic Horror, please sign up. Great collection and thoughtfully put together. Mitzi Szereto (https://mitziszereto.com) is an author and anthology editor of multi-genre fiction and non-fiction, has her own blog Errant Ramblings: Mitzi Szereto’s Weblog, and is creator/presenter of the Web TV channel Mitzi TV, which covers “quirky” London, England. Her books include THE BEST NEW TRUE CRIME STORIES: SERIAL KILLERS; LADIES OF GOTHIC HORROR (A COLLECTION OF CLASSIC STORIES); FLORI Mitzi Szereto (https://mitziszereto.com) is an author and anthology editor of multi-genre fiction and non-fiction, has her own blog Errant Ramblings: Mitzi Szereto’s Weblog, and is creator/presenter of the Web TV channel Mitzi TV, which covers “quirky” London, England.